Increased Data Transparency Unveils Terminology in Disarray | Fleming. Various harmonization initiatives have been developed over the past decades for different purposes. The activities leading to the collection of the data and the data integrity follow International Conference on Harmonization (ICH) E6, while the planning of the project and the handling of data are primarily in accordance with ICH E9. The reporting of clinical trial outcomes is in accordance with ICH E3. Sponsors also report trial results in public registries such as ClinicalTrials.gov and in the literature, where the display of disposition data is often required to follow the CONSORT statement. Particularly in registries, space constraints for descriptive text are restrictive and require succinct language. 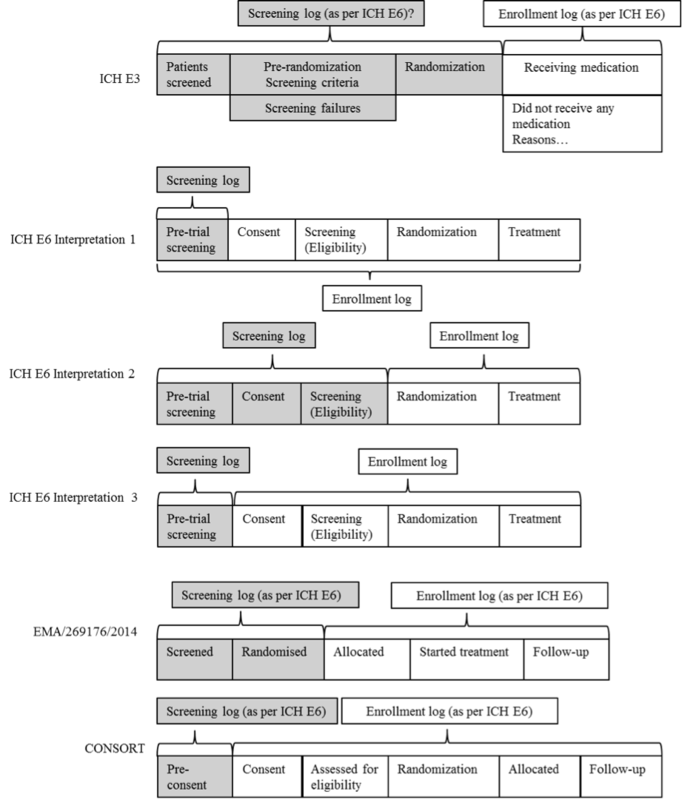 The participant flow in ClinicalTrials.gov is one of the main reporting sections. In the technical guidance on the format of data in the EudraCT database, screening details are required if results will not contain a pre-assignment period. Thus, potentially a trial may have to be reported differently in the European and US registries. With increasing transparency, there is not only a need for lay language to be used, but the need to harmonize the terminology used. To provide insight into the interpretation difficulties that have accompanied the understanding of disposition epochs and disposition terms, an illustrative example is given in Figure 1.